Written by Dame Rebecca West, Black Lamb and Grey Falcon: A Journey Through Yugoslavia is one of the literary masterpieces of the 20th century. Over 1,100 pages, the book gives an account of Balkan history and ethnography during West’s six-week trip to Yugoslavia in 1937. While researching its long and complicated history, West clarified her ideas about Yugoslavia – and about much else besides. The publication of the book in 1941 coincided with the Nazi Invasion of Yugoslavia. Black Lamb and Grey Falcon is more than a timeless guide to Yugoslavia – it is a portrait of the author’s soul and of Europe on the brink of war. Born Cicely Isabel Fairfield, Rebecca West (1892-1983) was a British author, journalist, literary critic and travel writer. An author who wrote in many genres, West reviewed books for The Times, the New York Herald Tribune, the Sunday Telegraph and The New Republic. Her major works include Black Lamb and Grey Falcon (1941), A Train of Powder (1955), her coverage of the Nuremberg trials and The Meaning of Treason, later The New Meaning of Treason, a study of the trial of British fascist, William Joyce and others. Time Magazine called her ‘indisputably the world’s number one woman writer’ in 1947. She was made a CBE in 1949 and DBE in 1959. West trained as an actress in London, taking the name ‘Rebecca West’ from the rebellious young heroine in Rosmersholm, written by Henrik Ibsen. She became involved in the suffrage movement. West worked as a journalist for the feminist weekly ‘Freewoman’ and the ‘Clarion’, drumming up support for the suffragette cause. In September 1912, West accused the writer H. G. Wells of being “the Old Maid among novelists” in a provocative review of his novel ‘Marriage’. The review attracted Wells’ attention and an invitation to lunch at his home. The two writers became lovers in late 1913. Their 10-year affair produced a son, Anthony West, and their friendship lasted until Wells’ death in 1946. 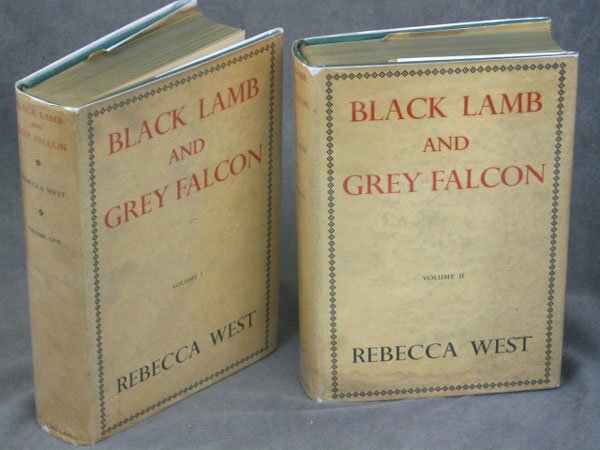 By the time Black Lamb and Grey Falcon: A Journey Through Yugoslavia was published – in two volumes totalling half a million words – West was somewhat at a loss to discover why she had been moved “in 1936 to devote five years of my life, at great financial sacrifice and to the utter exhaustion of my mind and body, to take an inventory of a country down to its last vest-button, in a form insane from any ordinary artistic or commercial point of view”. The result, which she feared “hardly anyone will read by reason of its length”, is one of the supreme masterpieces of the 20th century. The book’s inexhaustible capacity for self-fuelling discussion, for examining the implications of everything that it touches upon, is central to West’s structural and stylistic method. Any conclusions she draws are tied to the process by which they are being teased out. Black Lamb and Grey Falcon is, along with everything else, a great flood of ideas. As with Lawrence, it is impossible to say where sensation stops and cogitation begins. Black Lamb and Grey Falcon is a vast, ambitious and complex book which repeatedly stresses the kinship between homely and universal truths.